Water based, quick drying & low odour. Recoat after just 1 hour. 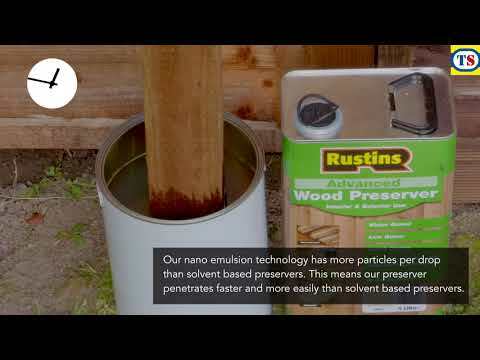 Deep penetrating protection against fungi, wood boring insects, and dry rot/wet rot. Can be applied to damp timber. Interior and exterior use. Approx coverage: 1 litre to 3-4m2. HSE Reg No: 9530 & 10048. Hazard Safety Codes: R50, R53. 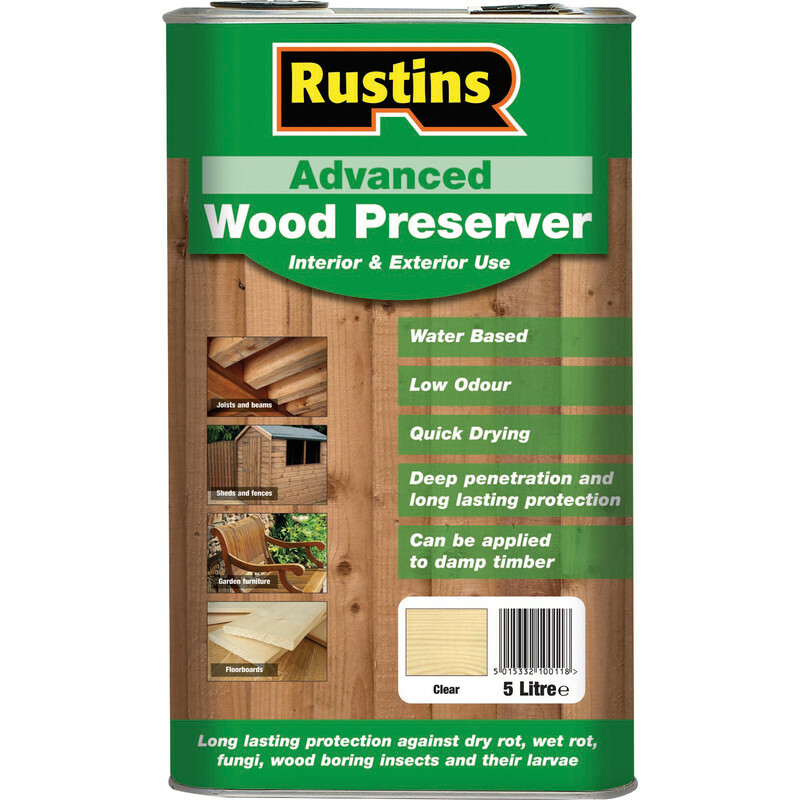 Rustins Advanced Wood Preserver 5L Clear is rated 4.4 out of 5 by 13. Rated 5 out of 5 by Plumbobs from Great product. Purchased recently for large garden job decking etc.Easy product to use cleans up easily dries quickly so no messy gloves after use. Hope it does what it’s supposed to. Not sure at this stage,that’s why only 3 stars ?? for performance. Rated 4 out of 5 by Steves107 from Tools water washable. Easy to use with good features. Rated 4 out of 5 by Octavia from Interesting Was surprised to find that this foams as it is applied, still seems to cover and soak in - actually the foam allows you to see where you have been, it does disappear after a couple of minutes. Only time will tell if it works. Rated 5 out of 5 by Tubbydad from Easy to apply little odour. I recently bought this instead of my normal "Silka" product . It is cheaper by many pounds and appears to contain the same effective ingredients. It seems to penetrate cross cut ends well . Would definitely consider buying again. As will all these products effectiveness and longevity can only show after passage of time. Rated 5 out of 5 by Buddha G from Easy to apply Bought for a new summerhouse, like painting with water, easy quick and clean to use.Dries quickly. Great price. Rated 4 out of 5 by floppy1968 from great product - but difficult to pour! Easy to apply, appears to penetrate the wood well. BUT If it is to toxic why make it so difficult to pour without getting it everywhere?